It's National Strawberry Day! Strawberries are one of my favorite fruits. 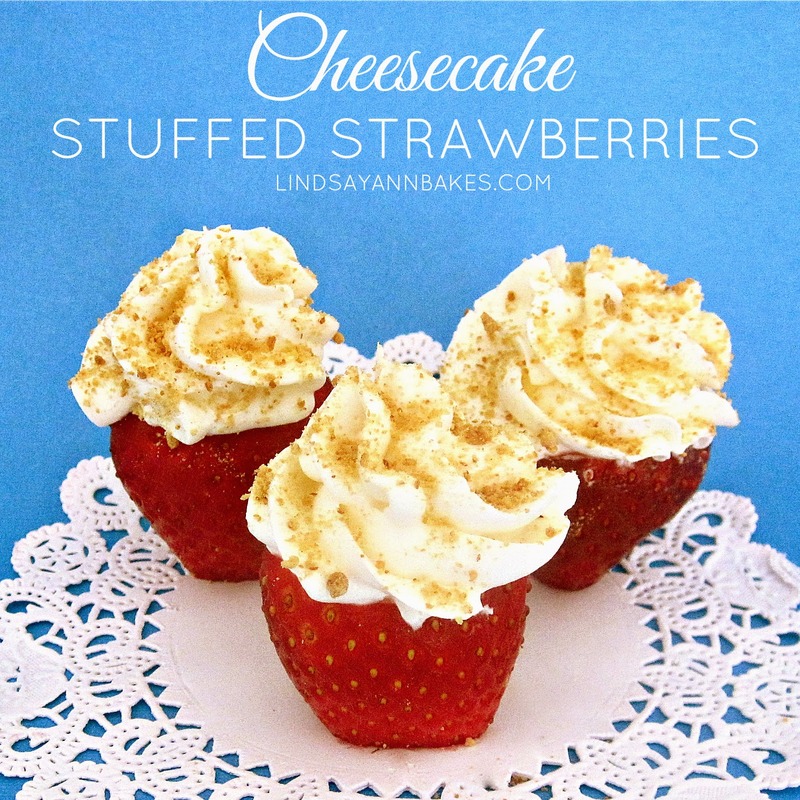 There are so many delicious ways to enjoy them, and so easy to incorporate into baking as they pair nicely with chocolate, vanilla, cakes, puddings, and pretty much anything sweet... Now, I've made strawberry cheesecake cupcakes, but the best part about this recipe is that it requires NO baking! You can even skip the no-bake cheesecake filling recipe below and fill your strawberries with some left over cheesecake. These cheesecake stuffed strawberries are a great alternative to other sweets because you have the option to make them as "lite" or "low-fat" as you want! They start with fresh fruit. Rinse and dry your strawberries. Hull strawberries with a sharp knife by cutting a cone shape out of each center. Slice off tips so they can stand on their own. Fill strawberries with my no-bake cheesecake filling (recipe below). I used a piping bag and the large star tip for a fancy looking swirl, but you can also just spoon the filling right in. Fill just before serving. Sprinkle with graham cracker crumbs for a tasty garnish. 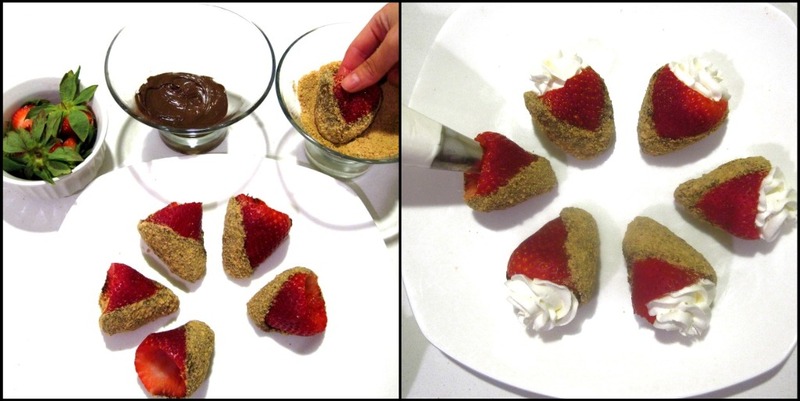 Chocolate Dipped: Instead of cutting tips off the strawberries, dip them in chocolate and roll in graham cracker crumbs. Fill with cheesecake filling, serve and enjoy. Chocolate Cheesecake: Add 3-4 tablespoons of cocoa powder to the cheesecake filling recipe below, for a chocolatey touch. Rinse and hull fresh strawberries. Cut off tips so they can stand up straight with the open end poiting upwards. Beat heavy whipping cream to medium peaks with electric mixer and set aside (skip this step if using store bought whipped topping). With an electric mixer, beat cream cheese (make sure it is room temp. to avoid lumps), sugar, lemon juice and vanilla on medium speed until smooth and creamy. Gently fold in your whipped cream or a tub of thawed whipped topping with a rubber spatula, until fully incorporated. Refrigerate mixture for at least 2 hours. Fill strawberries with cheesecake mixture just before serving. Sprinkle with graham cracker crumbs. 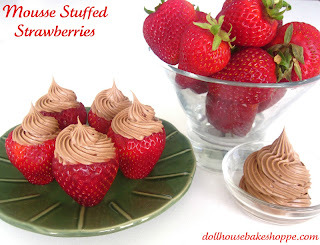 Check out my mousse stuffed strawberries for more stuffed strawberry fun! 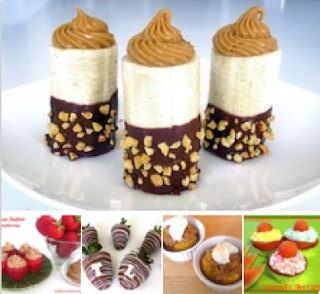 Or view my other fruit based treats on Pinterest!